The story begins in 1900. Houdini is on tour in Europe and has just had a successful run of shows in Dresden. 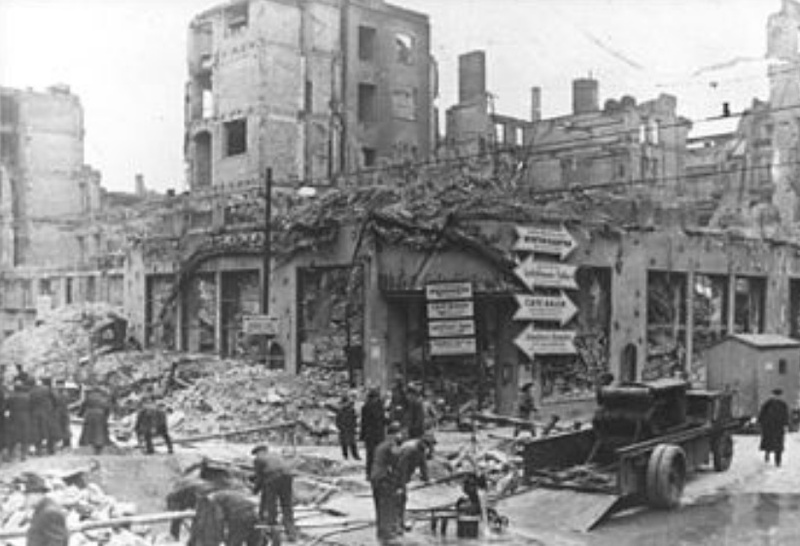 But trouble sprang up when Houdini was ordered to Berlin to have the police inspect his act. Kaiser Wilhem II gave the police the authority over much of German life, including regulating behavior and approving or disapproving entertainers. Houdini would have to prove he was a real handcuff king by being put to the test. He arrived in Berlin on Sept 20th and went to the police headquarters on the Alexanderplatz. In front of 300 policeman, Houdini was stripped, and placed in 5 pairs of hand cuffs, 2 pair of leg irons, some sort of finger locks and a pair of thumbscrews. According to the Kalush biography, these manacles were put on behind his back. Then a sheet was thrown over Houdini, to protect his secrets. Six minutes later, Houdini removed the sheet and held up the various manacles to show he was free. The police reluctantly gave Houdini a letter of approval. He then returned to Dresden. The manager, Herr Kammsetzer of the Central Theatre in Dresden, wanted to hold him over for a month due to the popularity of his show. Houdini was setting box office records in Dresden, and would continue to do this throughout his tour. 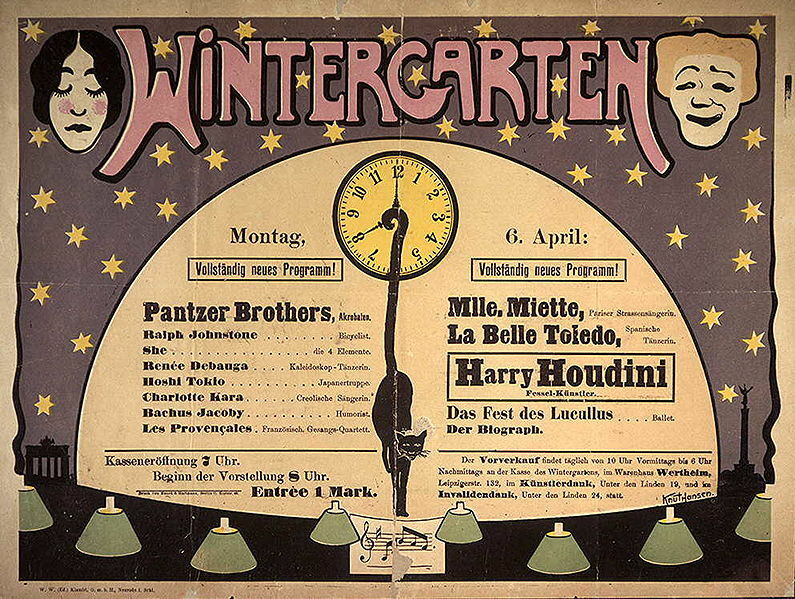 The managers at the Wintergarten in Berlin decided that if Houdini were indeed that popular, why would they allow him to stay longer in Dresden when they could be reaping the benefits in Berlin, so they declined. The Wintergarten was the go-to entertainment complex in Berlin during this time. The largest theater of it's kind in Berlin. They featured tons of European variety acts, as well as American performers. T. Nelson Downs, the King of Coins, also appeared at the Wintergarten only a few months before Houdini arrived. 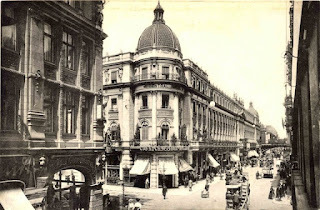 The theatre was housed within the Central Hotel and seated 4000 people. The theatre opened in 1887, and in 1895 showed a cinematograph. This made the Berlin Wintergarten the very first movie theater in history. 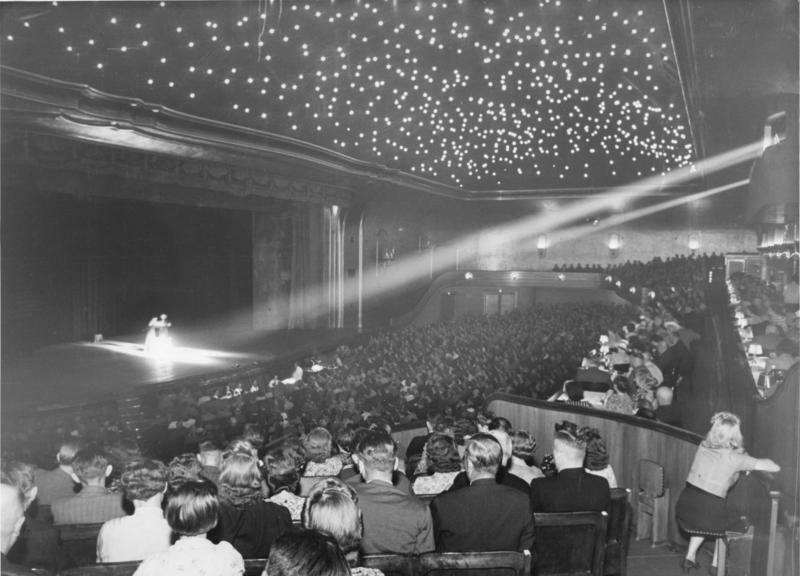 But according to the theatre's website the venue was used mainly for live performances right up until 1944. 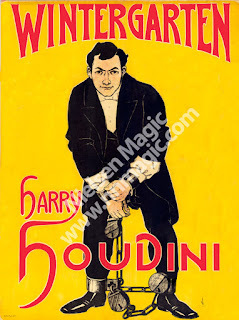 Houdini charmed his German audiences by speaking their native language. It was the language that his parents spoke while he was growing up. But his command of the language was less than perfect and the German newspapers made note of his mixture of broken English and broken German. Still, audiences were quite forgiving and seemed thrilled that the American would go through the trouble to speak German. During his first week at the Wintergarten, Houdini faced a challenge from an audience member who brought a unique set of thumbscrews with him. What made them unique was the fact that there were sharp pointed protrusions that gripped the thumbs so tight it was impossible to move. Houdini accepted the challenge and even though it was a painful ordeal, he did escape the thumbscrews. handcuffs, as they thought they were too weak. Rather, they had their own, and quite a few different types and styles. According to Houdini, "using a key was out and this made escaping 1000 times more difficult." So to combat the problem, Houdini worked with German locksmiths during the days to learn the ins and outs of these German handcuffs. One very frustrating part of his European tour were the constant imitators. Some would show up at Houdini's shows, others he would go to their shows and confront them. One magician by the name of Hermann (not one of the famous Herrmanns), claimed to be the true and only handcuff king. Houdini got wind of this and went to see his show. When Hermann called for a committee from the audience, Houdini joined the pack. Hermann did not realize Houdini was among those onstage when he began to brag about previously beating Houdini. That's when Houdini burst forth and made himself known to the crowd and the performer. This confrontation apparently turned into nothing more than a battle of words, with Houdini claiming victory. In November, during his extended run at the Wintergarten, another German magician showed up during Houdini's performance with the hopes of taking down the true Handcuff King. He went by the stage name of Hillmar the Uncuffable, and he made the claim that he could get out of things that Houdini could not. So Houdini slapped on a pair of German made cuffs known as Berliners. The would-be challenger struggled and after several minutes cried to be released. Houdini finished his run in Germany at the end of November, but would be back in only a few short months to tour the country again. I want to keep this article to just the Wintergarten, but the paragraph below kind of sums of how well Houdini was doing in Germany. T. Nelson Downs writing in the column, Our Letter Box, in the May 1902 edition of Sphinx Magazine says that "Houdini, absolutely is the biggest sensation ever made in Germany in the history of Vaudeville there." Downs mentions that Houdini won his lawsuit in Cologne against a policeman and the newspaper and both would have to retract things they said about Houdini. Houdini reaped the rewards of having won this case through incredible advertising that followed. Mr.Downs also mentions that Houdini was booked solid for the next two years, "when I believe he will retire for a season to count his money." In April 1903, Houdini returned to the Wintergarten and picked up where he left off, with massive crowds. According to a report in the Sphinx magazine May 1903, Houdini was presenting all manner of escapes, including a chair escape, a straitjacket escape, and being placed inside a packing crate or what they called, an ordinary dry goods box. The box was then nailed shut and wrapped and tied with ropes. Yes, the master of escape somehow freed himself without disturbing the ropes and leaving all the nails intact. Also, on page 33 of the May 1903 Sphinx Magazine, is a reprint of a letter from Houdini to Harry S. Thompson. In the letter, Houdini mentions a number of interest facts related to his time in Germany. One of the things he is having to deal with are the exposers. It was one thing to have to deal with imitators, but the exposers were worse. There were apparently, a number of people, in every city he went to, that were exposing his effects. In Dresden, he had to contend with a man named Cirnoc, who was hired by a rival theatre to expose his handcuff escapes and his trunk trick. When Houdini arrived in Berlin to perform at the Wintergarten, the Circus Shumann, hired a clown to expose the trunk trick. It was all in an effort to hurt the business at the Wintergarten. But despite the exposures, Houdini prevailed. Just a side note on the Wintergarten. It remained a popular variety entertainment house until June 21st 1944 when it was totally destroyed in an Allied bombing attack. In 1992, the Wintergarten reopened at a different location. It still thrives today as a live performance venue and they have over the years featured magic programs in their line ups. *The story of this poster is interesting. It is in the current collection of Norm and Lupe Nielsen. Lupe tells me she believes the poster was from around 1903. They obtained the poster from a small magic poster collector in Salt Lake City. That gentleman purchased it many many years before, and recognized it was rare back then. A second copy appears on the background of George Goebel's book, so she believes that he has a copy. Two known copies in all the world? Seems to be the case. I have a feeling however, that the poster might be from 1900, as the photo used in the illustration dated to this time period. 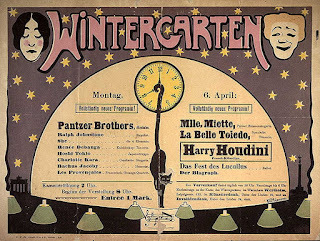 Also, I read that the Wintergarten had postcards printed with Houdini in chains that they passed out during his extended run in November 1900. It's possible this image was also on the postcards. But regardless of it being 1900 or 1903, it's still a fantastic and rare poster. THANK YOU Lupe, for letting me use the poster in the article and for the background information on how you came upon the poster. Great stuff Dean! Thanks! Harry had it rough at the Wintergarten: Exposers, imitators, and German cuffs he was not familiar with. Thanks Leo, glad you liked it. Houdini did have his fair share to deal with but he made a King's fortune in the process!